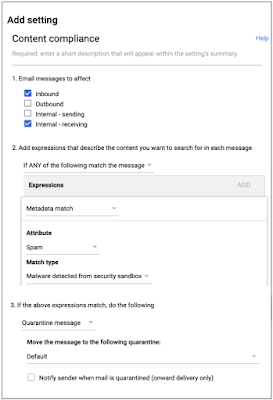 Security sandbox for Gmail (beta) detects the presence of previously unknown malware in attachments by virtually "executing" them in a private, secure sandbox environment, and analyzing the side effects on the operating system to determine malicious behavior. Settings impact admins only. If turned on, users may notice a delay of a few minutes in the delivery of affected mail due to scanning time. Security sandbox provides an additional level of anti-malware protection over and above conventional detection. By virtually opening an attachment in a secure environment that can analyze the effects on the target operating system, it’s better able to detect ransomware, sophisticated malware propagated through embedded scripts (like files containing macros or .js files), and zero-day threats. Admins: Find and turn on the beta security sandbox feature at Admin console > Menu > Apps > G Suite > Gmail > Advanced settings. Use our Help Center to find more information on how to detect harmful attachments. If desired, admins will be able to set up custom rules to control which messages are tested in the security sandbox. If custom rules are not applied, all messages with attachments sent to the OU will be checked in the sandbox. Rules can be customized for each organizational unit (OU). Admins can also decide what to do with messages that have malware. Malware detected by Security Sandbox is put in the spam folder by default. You can quarantine malware attachments detected by Security Sandbox instead. 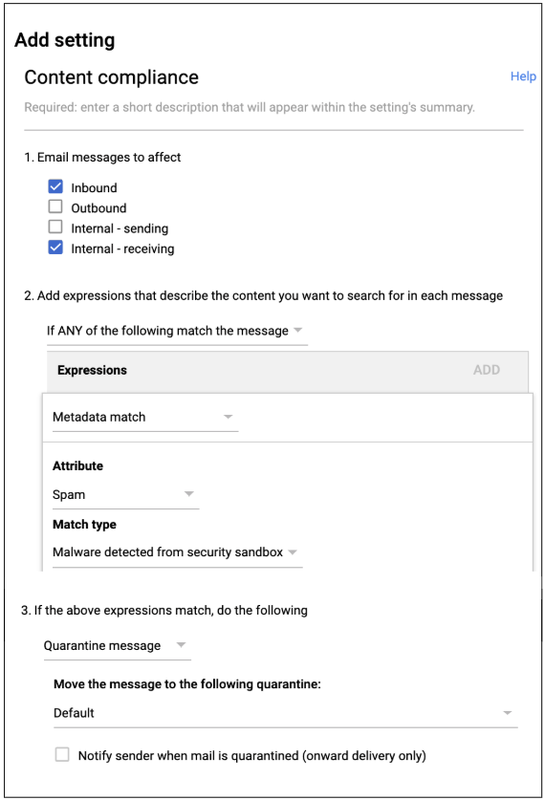 Create a content compliance rule using the spam metadata attribute. This feature will be OFF by default and can be customized at an OU level.